The Kyoto Office will be closed from August 13th until August 17th for the Obon holidays. They will reopen on Monday, August 20th. All inquiries may be sent to our U.S. Office at Pomona College. What is Obon? Obon is the Japanese Buddhist custom of returning to the family home to pay respects to one’s ancestors. Traditionally, Obon is a time to visit relatives and to hang lanterns in front of your house to welcome the spirits of your ancestors. 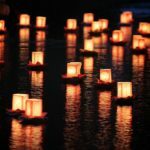 In the Arashiyama area of Kyoto, there is a beautiful floating lantern festival to mark the end of Obon. The lanterns serve to guide the spirits back into their world.